The Friendship Award is the highest award of People’s Republic of China for foreign experts who have made outstanding contributions to the country’s economic and social progress. The award was first established in 1950s, when it was given to experts from the former Soviet Union and East European countries by the then premier Zhou Enlai and the foreign minister Chen Yi. After the reopening of China, a new Friendship Award was reintroduced in 1991. Since then, the winners have been selected by the State Administration of Foreign Experts Affairs (SAFEA) under the State Council. The award is conferred as part of the celebrations for the National Day of the People’s Republic of China (October 1). It is a great honor for experts to be invited to the awards ceremony and it is not only in recognition of the foreign expert’s contribution to the Chinese, but also a symbol of friendship. 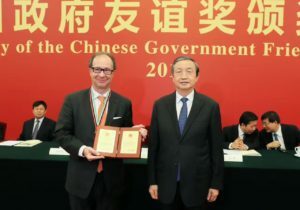 Mr. Bernard Dewit, Chairman of Belgian-Chinese Chamber of Commerce, has been actively engaging in China-Belgium economic and trade investment cases since 1983, promoting China-Europe legal and judicial cooperation. He helped many Chinese enterprises to going abroad, and gave valuable legal and commercial advice to a large number of European investors in China.